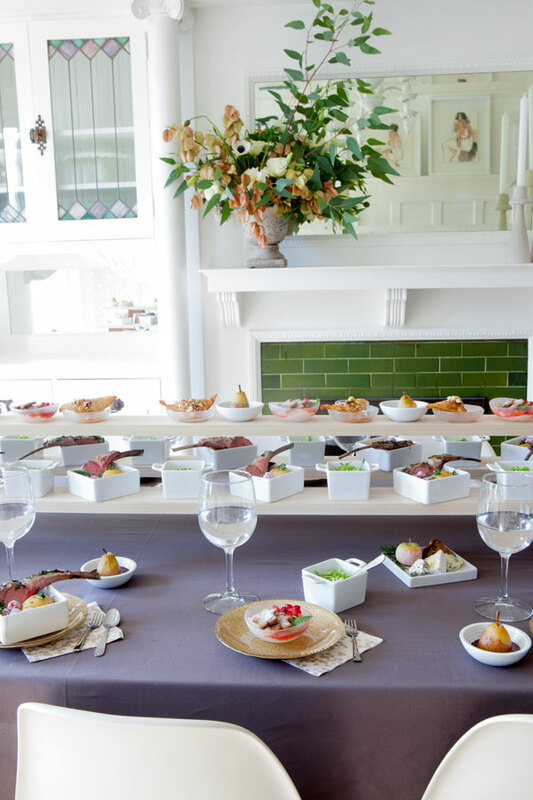 For a holiday party this year, I thought it would be fun to host a dinner party where all the food was miniature. My friend Andrea came up with the perfect mini menu. 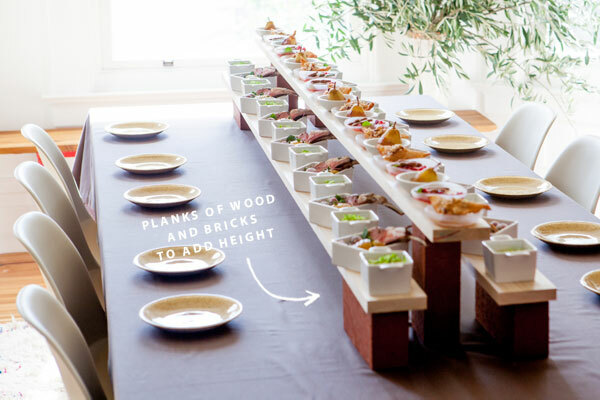 I wanted a fun way to present it so I went to the hardware store and bought some thin planks of wood and some bricks to line up all the pretty dishes down the table. It was so easy and looked so pretty. 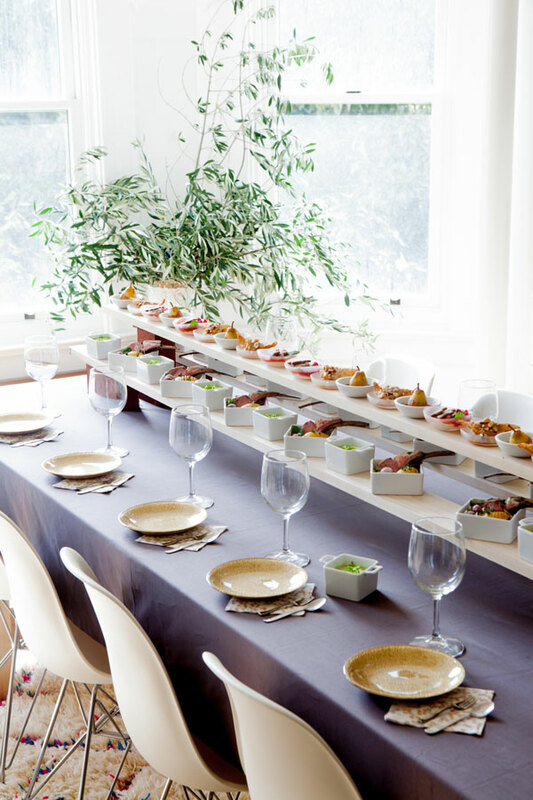 I always shop at Crate and Barrel for mini dishes (I have for years!). 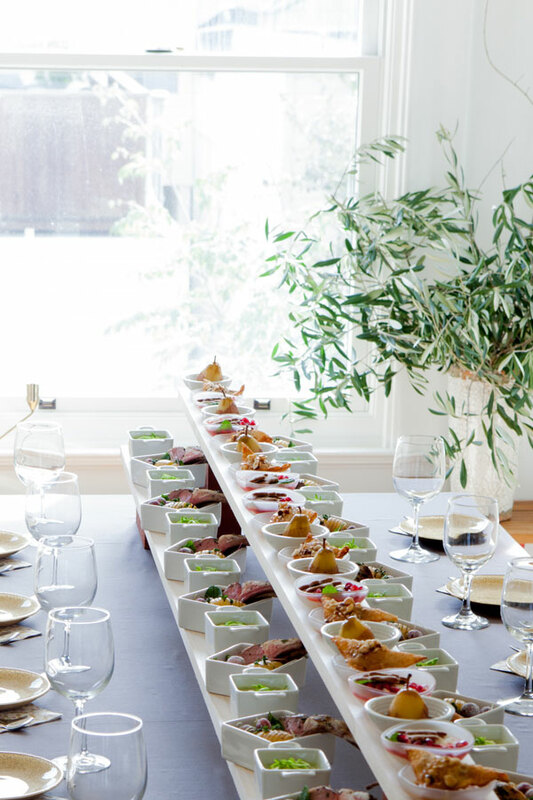 They have the best selection of appetizer plates and holiday entertaining supplies. Click through below to our party. Combine sugar and pomegranate juice in a small saucepan. Bring to a simmer, stirring occasionally until sugar is dissolved. Continue to simmer about 20-30 minutes, until thick and reduced to about ⅔ cup. Cool completely. Step 1: Cream together shortening and sugar. Combine flour, salt, and spices in a separate bowl. Add flour mixture and water to shortening mixture, mix until well combined and dough has formed. Cover dough and chill thoroughly, about 3 hours. Step 2: Roll out to about 1/8″ thick and cut with mini gingerbread man cookie cutter. Transfer carefully to a baking sheet lined with parchment or a silicone baking mat and dust each shape with superfine sugar. To help cookies keep their shape, before baking place baking sheet in the freezer for 10-20 minutes, until dough is very well chilled. Step 1: Add all ingredients to the bowl of an electric mixer fitted with a whisk attachment. Beat until soft peaks form. Cover and refrigerate for at least 3 hours. Step 2: Transfer to large piping bag fitted with a large round tip. Pipe into mini glass oval bowls. Step 3: Drizzle pomegranate syrup around the edge of the dish, and top with pomegranate arils. 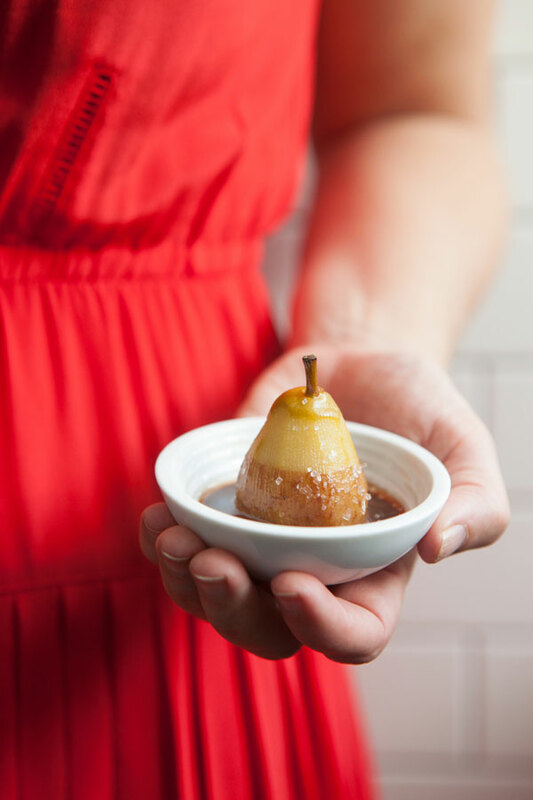 Serve with mini gingerbread men. 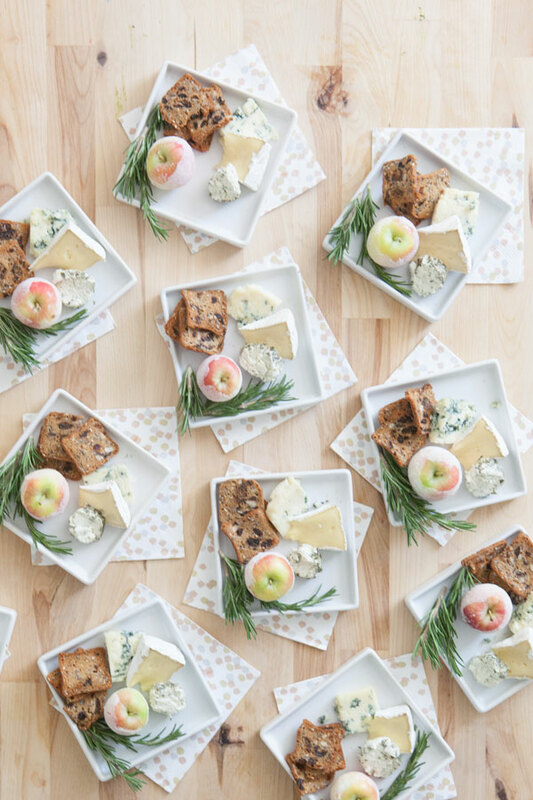 These miniature cheese plates have sugared mini apples, three kinds of cheese and some crackers and breads. Step 1: Melt 2 tablespoons of the butter in a large pot over medium heat. Add leeks and cook for 2 minutes. Add asparagus and cook for 2 minutes more. Add 1 cup of broth and bring to a boil. Simmer until leeks and asparagus are tender, about 10 minutes. Allow to cool for about 10 minutes. Step 2: Transfer to a blender and puree until smooth. Set aside. Step 3: Return the pot to the stove and melt remaining 4 tablespoons of butter over medium heat. Add flour, salt, and pepper and cook, stirring frequently, until very thick. Step 4: Add the pureed asparagus, cream and remaining 2 cups of broth. Stir until well combined and heated through. 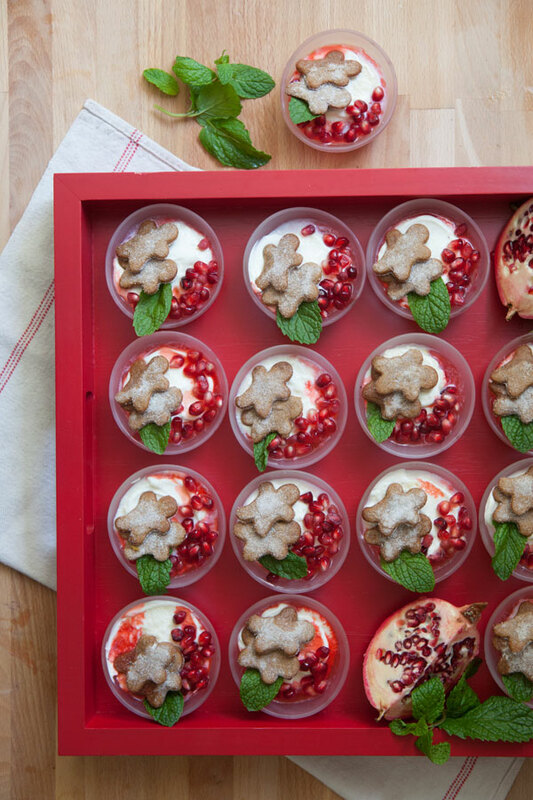 Step 5: Serve in mini square ramekins. 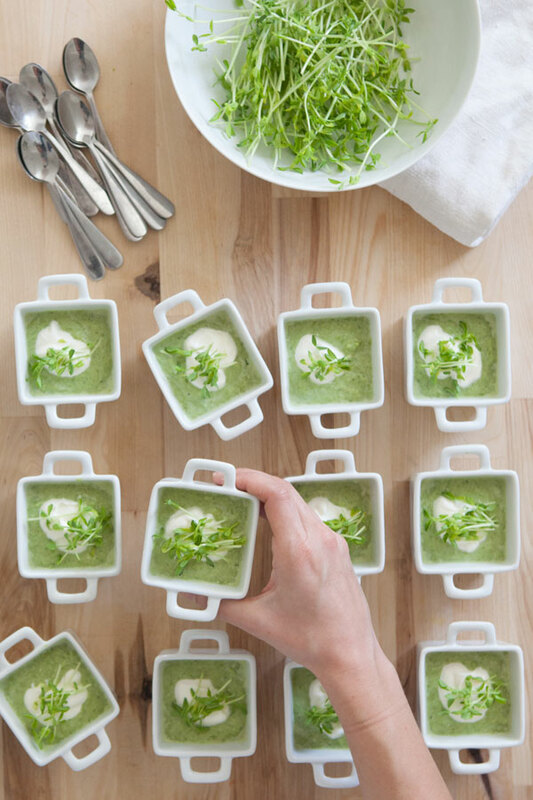 Top with a dollop of creme fraiche and pea shoots. To toast hazelnuts: Heat oven to 350°F. Spread hazelnuts on a baking sheet. Toast for about 10-15 minutes, until hazelnuts are lightly browned and skins are starting to separate. Remove from oven and allow to cool. Rub cooled hazelnuts in a towel to remove any loosened skins. Chop. Step 1: Lay out wonton wrappers on a clean surface. In the center of each wrapper, drop a small spoonful of chocolate hazelnut spread, about 1 to 1 1/2 teaspoon, being careful to leave the edges clear. Top with a pinch or two of chopped toasted hazelnuts. With a small pastry brush or your finger, moisten the edges with a small amount of water. Fold wrapper in half diagonally, pressing firmly around the edges to seal. Step 2: Fill a heavy medium sauce pan with about 3 inches of oil. Heat to 360°F over medium heat. Step 3: Working with 3-4 at a time, slide wontons into the oil. Working quickly, flip wontons until each side is nicely browned and golden, about 1 minute total. Remove from oil with tongs or a slotted spoon and transfer to a baking sheet lined with paper towels to drain. 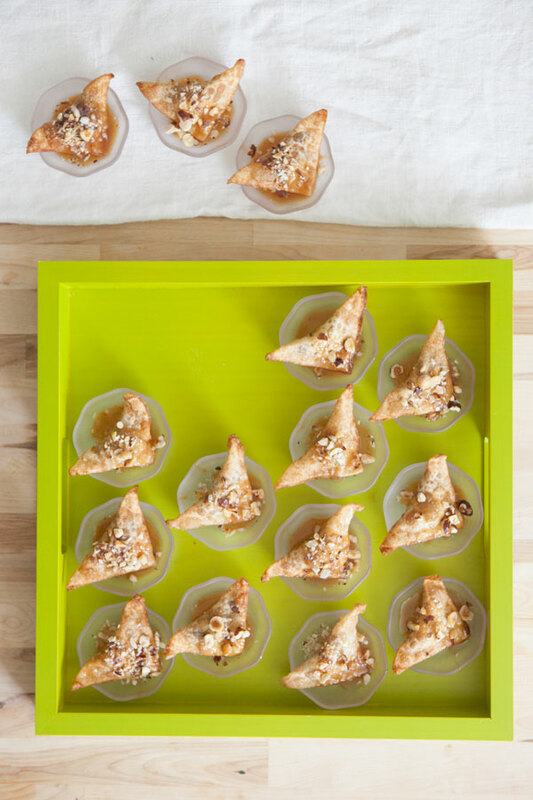 Step 4: Place each wonton in a mini glass octagon bowl. Top with warmed caramel sauce and remaining chopped hazelnuts. Serve immediately. This post is sponsored by Crate and Barrel all opinions are my own. This may be the cutest mini spread I have ever seen. 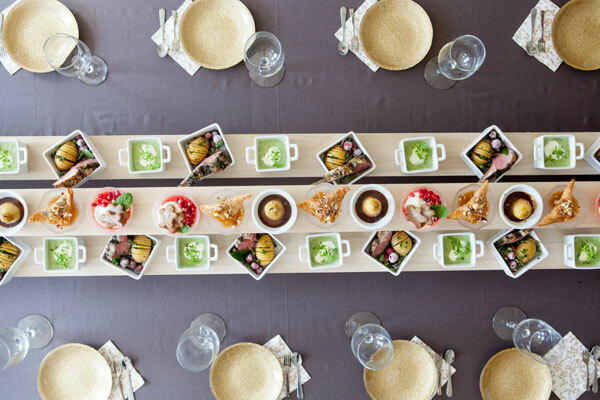 The asparagus soup sounds AMAZING. This is SO appealing. LOVE the small servings, the variety, and the display. Wowza! This is such a beautiful spread. Well done! Gorgeous! And everything sounds SO delicious! Love it!!! Love the planks and bricks for height — so smart! This is such an adorable idea! Everything is cuter when it’s mini. Jordan, this looks AMAZING! Wow. I love this! All look divine. Very colorful and wonderfully styled! This is such a beautiful spread. Well done! 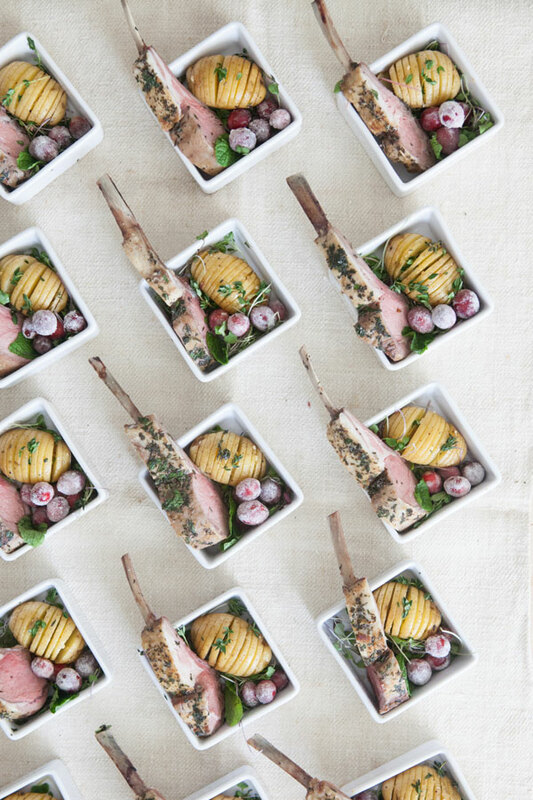 Love the idea of having mini plates! Looks great. This post made me seriously hungry! What a brilliant idea. 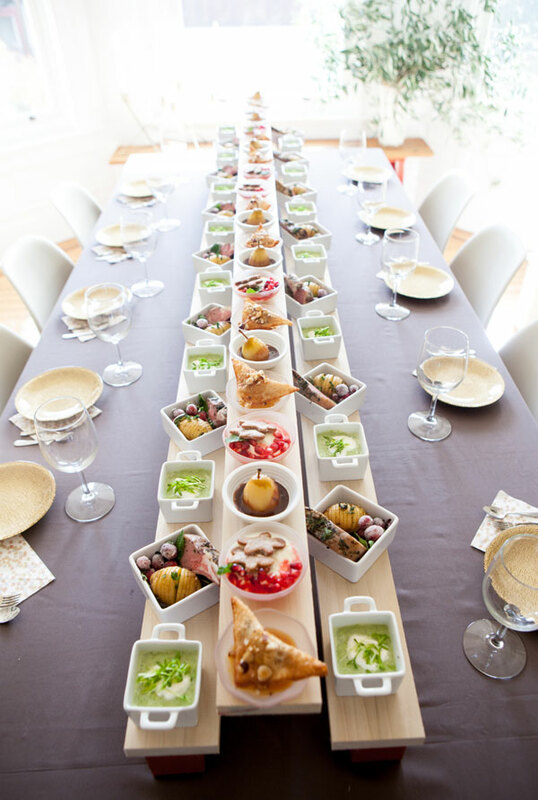 I love doing finger foods for parties, but this is so much more! Wow! This looks delicious, creative, and beautiful. Looking forward to following what else you do. Happy Holidays. is that Olive Branches in the corner vase? seriously, gorgeous. oh. and the food, too. perfect! Holy cow! This is beautiful/adorable/incredibly tempting! Everything looks amazing!